This Protein Could Change Biotech Forever, we drew over 40 comments. The ability to make modular changes in the DNA of bacteria and primitive algae has resulted in drug and biofuel companies such as Amyris and LS9. But figuring out how to make changes in the genomes of more complicated organisms has been tough. In this article we bring all the pieces to one place, telling the evolution of a series of discoveries, which together may have the Protein, Cas9, changing the Biotech Industry forever with its contributions to Diagnosing Diseases and Gene Therapy by Precision Genome Editing and Cost-effective microRNA Profiling. Current methods of detecting microRNA (miRNA) — gene-regulating molecules implicated in the onset of various diseases — can be time-consuming and costly: The custom equipment used in such tests costs more than $100,000, and the limited throughput of these systems further hinders progress. Two MIT alumni are helping to rectify these issues through their fast-growing, Cambridge-headquartered startup, Firefly BioWorks Inc., which provides technology that allows for rapid miRNA detection in a large number of samples using standard lab equipment. This technology has helped the company thrive — and also has the potential to increase the body of research on miRNA, which could help lead to better disease diagnosis and screening.The company’s core technology, called Optical Liquid Stamping (OLS) — which was invented at MIT by Firefly co-founder and Chief Technical Officer Daniel C. Pregibon PhD ’08 — works by imprinting (or stamping) microparticle structures onto photosensitive fluids. The resulting three-dimensional hydrogel particles, encoded with unique “barcodes,” can be used for the detection of miRNAs across large numbers of samples. These particles are custom-designed for readout in virtually any flow cytometer, a cost-effective device that’s accessible to most scientists.“Our manufacturing process allows us to make very sophisticated particles that can be read on the most basic instruments,” says co-founder and CEO Davide Marini PhD ’03.The company’s first commercial product, FirePlex miRSelect, an miRNA-detection kit that uses an assay based on OLS-manufactured particles and custom software, began selling about a year ago. Since then, the company has drawn a steady influx of customers (primarily academic and clinical scientists) while seeing rapid revenue growth. To date, most of the company’s revenue has come from backers who see value in Firefly’s novel technology. In addition to a cumulative $2.5 million awarded through Small Business Innovation Research grants — primarily from the National Cancer Institute — the company has attracted $3 million from roughly 20 independent investors. Its most recent funding came from a $500,000 grant from the Massachusetts Life Sciences Center. Pregibon developed the technology in the lab of MIT chemical engineering professorPatrick Doyle, a Firefly co-founder who serves on the company’s scientific advisory board. Firefly’s intellectual property is partially licensed through the Technology Licensing Office at MIT, along with several other Firefly patents. Firefly’s technology, from OLS to miRNA detection, has been described in papers published in several leading journals, including Science, Nature Materials, Nature Protocols and Analytical Chemistry. The success of the technology, Marini says, derives from an early business decision to focus attention on the development of the hydrogel particle instead of the equipment needed. Essentially, this allowed the co-founders to focus on developing a high-quality miRNA assay and hit the market quickly with particles that are universally readable on basic lab instrumentation. Firefly’s particles appear to a standard flow cytometer as a series of closely spaced cells; these data are recorded and the company’s FireCode software then regroups them into particle information, including miRNA target identification and quantity. The company’s FirePlex kit allows researchers to assay (or analyze) roughly 70 miRNA targets simultaneously across 96 samples of a wide variety — including serum, plasma and crude cell digests — in approximately three hours. This is actually a “middle-ground” assaying technique, Pregibon says, and saves researchers time and money: Until now, scientists were forced to use separate techniques to look at a few miRNA targets over thousands of samples, or vice versa. Marini adds that if a scientist suspects a number of miRNAs, perhaps 50 or so, could be involved in a pancreatic-cancer pathway, the only way to know for sure is to test those 50 targets over hundreds of samples. “There’s nowhere to do this today in a cost-effective, timely manner. Our tech now allows that,” he says. Because miRNAs are so important in the regulation of genes, and ultimately proteins, they have implications in a broad range of diseases, from cancer to Alzheimer’s disease. Several studies have suggested these relationships, but the field currently lacks the validation required to definitively demonstrate clinical utility. Pregibon says Firefly’s technology can be used across several molecule classes that are important in development and disease research: proteins, messenger RNA and DNA, among many others. “Essentially, the possibilities are endless,” Pregibon says. Researchers at MIT, the Broad Institute and Rockefeller University have developed a new technique for precisely altering the genomes of living cells by adding or deleting genes. The researchers say the technology could offer an easy-to-use, less-expensive way to engineer organisms that produce biofuels; to design animal models to study human disease; and to develop new therapies, among other potential applications.To create their new genome-editing technique, the researchers modified a set of bacterial proteins that normally defend against viral invaders. Using this system, scientists can alter several genome sites simultaneously and can achieve much greater control over where new genes are inserted, says Feng Zhang, an assistant professor of brain and cognitive sciences at MIT and leader of the research team.“Anything that requires engineering of an organism to put in new genes or to modify what’s in the genome will be able to benefit from this,” says Zhang, who is a core member of the Broad Institute and MIT’s McGovern Institute for Brain Research.Zhang and his colleagues describe the new technique in the Jan. 3 online edition ofScience. Lead authors of the paper are graduate students Le Cong and Ann Ran.Early effortsThe first genetically altered mice were created in the 1980s by adding small pieces of DNA to mouse embryonic cells. This method is now widely used to create transgenic mice for the study of human disease, but, because it inserts DNA randomly in the genome, researchers can’t target the newly delivered genes to replace existing ones. Proc Natl Acad Sci U S A. 2012 September 25; 109(39): E2579–E2586. Clustered, regularly interspaced, short palindromic repeats (CRISPR)/CRISPR-associated (Cas) systems provide adaptive immunity against viruses and plasmids in bacteria and archaea. The silencing of invading nucleic acids is executed by ribonucleoprotein complexes preloaded with small, interfering CRISPR RNAs (crRNAs) that act as guides for targeting and degradation of foreign nucleic acid. Here, we demonstrate that the Cas9–crRNA complex of the Streptococcus thermophilus CRISPR3/Cas system introduces in vitro a double-strand break at a specific site in DNA containing a sequence complementary to crRNA. DNA cleavage is executed by Cas9, which uses two distinct active sites, RuvC and HNH, to generate site-specific nicks on opposite DNA strands. Results demonstrate that the Cas9–crRNA complex functions as an RNA-guided endonuclease with RNA-directed target sequence recognition and protein-mediated DNA cleavage. These findings pave the way for engineering of universal programmable RNA-guided DNA endonucleases. The mechanism proposed here for the cleavage of dsDNA by the Cas9–crRNA complex differs significantly from that for the type I-E (former “Ecoli”) system (7). In the E. coli type I-E system crRNA and Cas proteins assemble into a large ribonucleoprotein complex, Cascade, that facilitates target recognition by enhancing sequence-specific hybridization between the crRNA and complementary target sequences (7). Target recognition is dependent on the PAM and governed by the seed crRNA sequence located at the 5′ end of the spacer region (24). However, although the Cascade–crRNA complex alone is able to bind dsDNA containing a PAM and a protospacer, it requires an accessory Cas3 protein for DNA cleavage. Cas3 is an ssDNA nuclease and helicase that is able to cleave ssDNA, producing multiple cuts (10). It has been demonstrated recently that Cas3 degrades E. coli plasmid DNA in vitro in the presence of the Cascade–crRNA complex (25). Thus, current data clearly show that the mechanistic details of the interference step for the type I-E system differ from those of type II systems, both in the catalytic machinery involved and the nature of the molecular mechanisms. In type IIIB CRISPR/Cas systems, present in many archaea and some bacteria, Cmr proteins and cRNA assemble into an effector complex that targets RNA (6, 12). In Pyrococcus furiosus the RNA-silencing complex, comprising six proteins (Cmr1–Cmr6) and crRNA, binds to the target RNA and cleaves it at fixed distance from the 3′ end. The cleavage activity depends on Mg2+ ions; however, individual Cmr proteins responsible for target RNA cleavage have yet to be identified. The effector complex of Sulfolobus solfataricus, comprising seven proteins (Cmr1–Cmr7) and crRNA, cuts invading RNA in an endonucleolytic reaction at UA dinucleotides (13). Importantly, these two archaeal Cmr–crRNA complexes perform RNA cleavage in a PAM-independent manner. Overall, we have shown that the Cas9–crRNA complex in type II CRISPR/Cas systems is a functional homolog of Cascade in type I systems and represents a minimal DNAi complex. 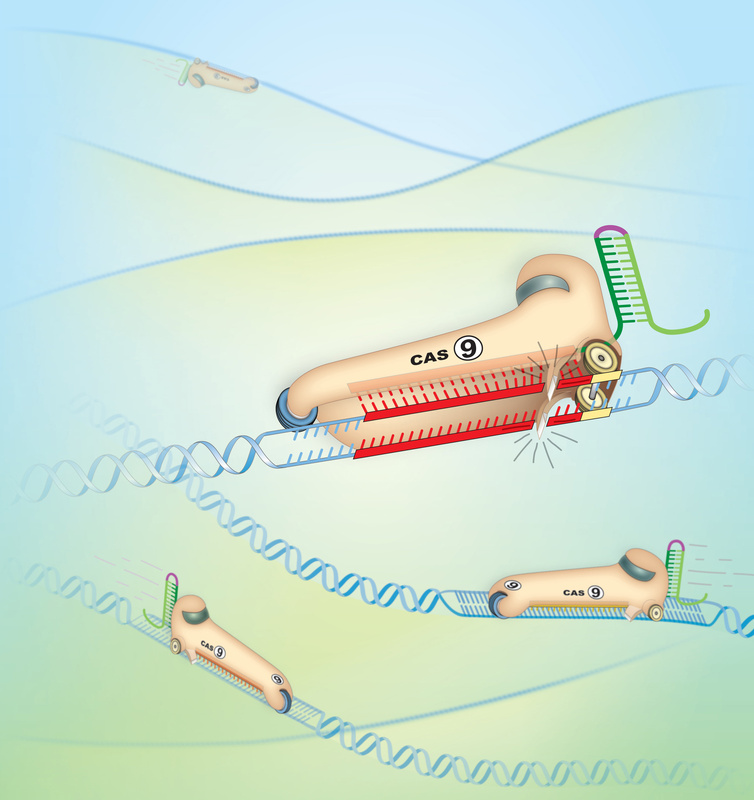 The simple modular organization of the Cas9–crRNA complex, in which specificity for DNA targets is encoded by crRNAs and the cleavage enzymatic machinery is brought by a single, multidomain Cas protein, provides a versatile platform for engineering universal RNA-guided DNA endonucleases. 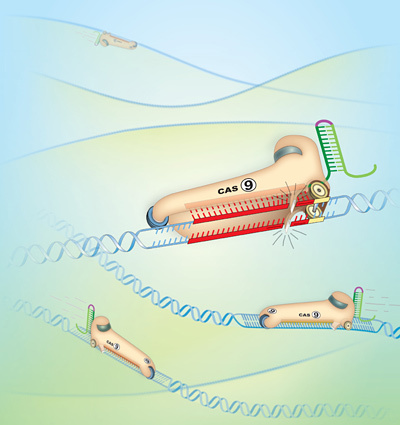 Indeed, by altering the RNA sequence within the Cas9–crRNA complex, programmable endonucleases can be designed both for in vitro and in vivo applications. To provide proof of principle of such a strategy, we engineered de novo into a CRISPR locus a spacer targeted to a specific sequence on a plasmid and demonstrated that such a plasmid is cleaved by the Cas9–crRNA complex at a sequence specified by the designed crRNA. Experimental demonstration that RuvC and HNH active-site mutants of Cas9 are functional as strand-specific nicking enzymes opens the possibility of generating programmed DNA single-strand breaks de novo. Taken together, these findings pave the way for the development of unique molecular tools for RNA-directed DNA surgery. BERKELEY —A simple, precise and inexpensive method for cutting DNA to insert genes into human cells could transform genetic medicine, making routine what now are expensive, complicated and rare procedures for replacing defective genes in order to fix genetic disease or even cure AIDS. Kathy Giusti has faced her cancer with the verve of an entrepreneur. Now her fight with multiple myeloma has moved to a new front: DNA. Giusti was a 37-year-old marketing executive at Searle (now part of Pfizer) when she was diagnosed in 1996 with myeloma, a deadly blood and bone marrow cancer. She had a 1-year-old daughter. Sixty percent of myeloma patients die within five years, but Giusti beat the odds, living for a decade and a half through multiple rounds of drug therapy and a bone marrow transplant from her twin sister. She has also changed the way her disease is treated. Giusti founded an advocacy group, the Multiple Myeloma Research Foundation, that works with companies like Novartis, Celgene, and Merck to develop new treatments. It played a key role in the development of Velcade and Revlimid, two of the biggest advances in treating the disease, which is diagnosed in 20,000 patients a year. Now a new research effort, funded with $14 million of MMRF money, has revealed new hints at what causes the disease and potential avenues for treating it. “This is going to be the next wave of how health care gets changed over time,” Giusti says. The results are published in the current issue of Nature. Working with patient samples collected by the MMRF and using DNA sequencers made by Illumina of San Diego, researchers at the Broad Institute of MIT and Harvard sequenced the genes of 38 myeloma tumors and the DNA of the patients in whom they were growing. Tumors are twisted versions of the people in which they are growing; their DNA is mutated and disfigured, turning them deadly. By comparing DNA from healthy cells with malignant ones, researchers can find genetic differences that might be what led the tumors to go bad in the first place. This experiment would have been unthinkable just a few years ago, when sequencing a human being was so expensive that all the people whose DNA had been read out could fit in a small room. In 2005, the idea of producing 38 DNA sequences was laughable. Now it’s par for the course, and researchers expect thousands of genomes will be sequenced by the end of the year – and experiments like this are expected to become commonplace. What’s so exciting is that sometimes the DNA changes scientists find are completely unexpected. “There were genes we found to be recurrently mutated and yet no one had any clue that they had anything to do with multiple myeloma or any other cancer,” says Todd Golub, the Broad researcher who led the study. He splits his time with the Dana-Farber Cancer Institute. One gene, called FAM46C, was mutated in 13% of the cancers, but has never been studied in humans. “It appears no one had been working on it,” says Golub, but from studies in yeast and bacteria it appears that it has to do with how the recipes in genes are used to make proteins, the building blocks of just about everything in the body. Another surprise gene, called BRAF, is generating excitement because it is the target of a skin cancer drug developed by Plexxikon, a small biotech firm that is partnered with Roch and is being purchased by Daiichi Sankyo. For the 4% of myeloma patients who have this mutation, this drug might be an option. The challenge will be testing it: it will be difficult to find enough of these patients to conduct a clinical trial. The MMRF says early discussions on such a study are moving forward. Giusti imagines that in the future, the MMRF may fund studies not of myeloma, but of a mix of different cancers caused by similar genetic mutations. Several of the genes seem involved in the proteins that help guide epigenetics, a kind of molecular code written on DNA that may represent another kind of genetic code. The MMRF is already supporting some small drug companies that hope to create cancer drugs that target this second code. Golub, the Broad scientist, says that right now it doesn’t make sense for most multiple myeloma patients to get their full DNA sequences outside of clinical trials, although he can imagine that for patients who have failed every available treatment it might make sense as a way to come up with another drug to try. Moving past old ways of thinking about inventing new medicines to a new path that is based on genetics and a flood of biological data is going to be difficult. But Giusti has never been afraid of hard — and she is sure there will be ways to drive the science forward.